69.5cm in height, 52cm in width, and 27cm in depth. Stone type: Box ground oolite. 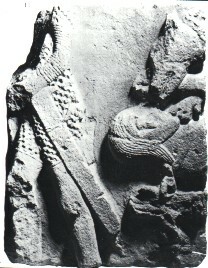 Frieze fragment, dated to the tenth century. There are two scenes on this fragment. The one on the left shows a figure, whose head is missing, walking to the left. He is clad in mail and has a straight broad-bladed sword. On the right there is a man lying on his back and tied around the neck and right wrist. Above him there is the head, part of the shoulder, and fore-paw of a dog or wolf. The tongue of the animal is extended and inserted into the man's mouth. This is thought to be a scene from the Sigmund saga. Backhouse, J. Turner, D.H. Webster, L., The Golden Age of Anglo-Saxon Art 1st, British Museum, London (1984) Art, Anglo-Saxons..